The innovations in the Alpha 76 Express are part of Cheoy Lee’s DNA. From beautiful ketches to high-speed patrol boats and passenger ferries, Cheoy Lee understands fast passage making. From large yachts designed by Hargrave, Fexas, Mulder and Ron Holland to powerful tugs and deep sea supply vessels, Cheoy Lee embraces its responsibility for reliability on the open ocean. 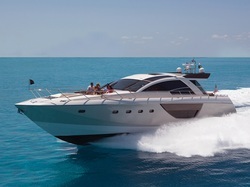 If the goal is to avoid compromise, this is a yacht that delivers the goods. While many sport yachts deliver speed at the expense of a bullet-like superstructure and a foredeck that’s uninhabitable underway, the bow of the Alpha 76 welcomes company. The Michael Peter’s designed hull is not only fast - he designs race boats after all—but it is remarkably dry. The bow lifts quickly and its shape ushers the sea and spray aft and away. You would expect a sport boat to offer sun pads forward, but the Alpha 76 will spoil you with full-size seating for your entire party, including comfy back rests and a high-low table for cocktails or dining. This creates two alfresco dining areas. The aft deck dining area and lounge can even be shaded by an awning that powers out from its own sleek compartment in the hardtop. Aboard the Alpha 76, the window and doors separating the aft deck from the salon disappear from view, creating a huge, flowing, indoor-outdoor living area on a single level. And one more thing ... there’s a second sun pad aft atop the hot tub with a commanding view of the world you’ve left behind. Luxury must be comfortable, otherwise it is not luxury.